+ We started with a lazy PD day for the girls- We shopped for glasses, did at home manis and just chilled before heading out for the evening. + Cinco de Mayo celebrations were at Taco Farm where we had tacos, guacs and margs- virgin and non. + We then headed to see Faith Grace- the girls' favourite local singer at a local (but kid friendly) brewery. + On Saturday, Anjali had a playdate with one of her besties before Skating. + We had Indian food before thematically watching Lion (amazing movie). We also watched the Marigold movies through the weekend. + I headed to a baby shower for my neighbour's daughter while the kids and D headed to a birthday celebration in Mississauga. +My neighbour Sue stopped by after for a glass of wine and some conversation before the kids came home and we called it a night. Cheers to a great Monday! Linking up with the lovely Biana for Weekending. Sounds like a fantastic and busy weekend full of lots of celebrating. Ending the evening with some girl chat and a glass of wine seems absolutely perfect! So cute to have manis and pedis at home with the girls! Sounds like a wonderful weekend with family and friends. I love your blue top with the statement necklace. I'm craving Indian food now! Luckily there's a restaurant right around the corner from my office. 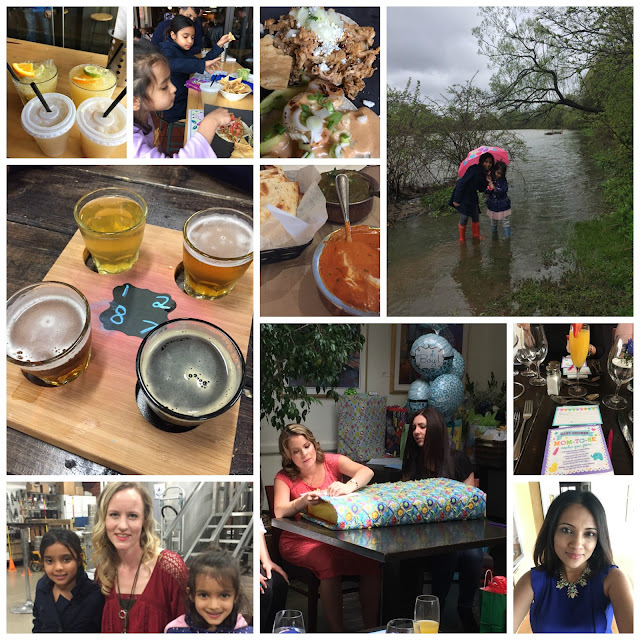 Weekending- last weekend of April!